— Watchmanz (@Watchmanz) 9 февраля 2017 г. — Emily Cooper (@em_cooper23) 10 февраля 2017 г. 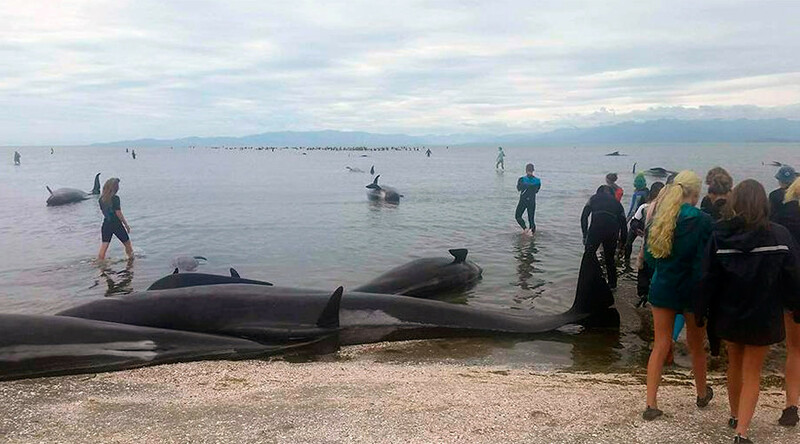 "This is quite emotional – it's encouraging to see the number of people who have come out to help ... We're going to give these whales the best chance we can,” said Louisa Hawkes, of the Project Jonah environmental organization, as cited by 1 News, which is running live updates on the large-scale rescue operation. — Syfygirl21 (@syfygirl21) 9 февраля 2017 г. — Cheree Phillips (@Chazza1014) 9 февраля 2017 г. — ABocic (@abocic) 9 февраля 2017 г. — KiwiRail (@KiwiRail) 9 февраля 2017 г. "What they're doing is milling around so we won't know until mid-afternoon whether we're going to have a restranding or not," Andrew Lamason, DOC Golden Bay operations manager, said as cited by Stuff. *stranding update* Some whales have re-stranded are being kept cool calm and comfortable by our medics and members of the public. — Project Jonah (@ProjectJonah) 10 февраля 2017 г.